IBF super-bantamweight champion Carl Frampton hopes that a world title unification fight against Scott Quigg can be organised. 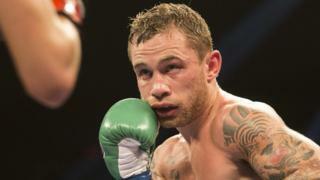 However, Frampton said that Quigg must realise who is the "boss" in negotiations for a possible fight. Frampton also revealed that he will stay at super-bantamweight after considering a move up in the wake of last weekend's points victory over Mexican Alejandro Gonzalez in Texas.